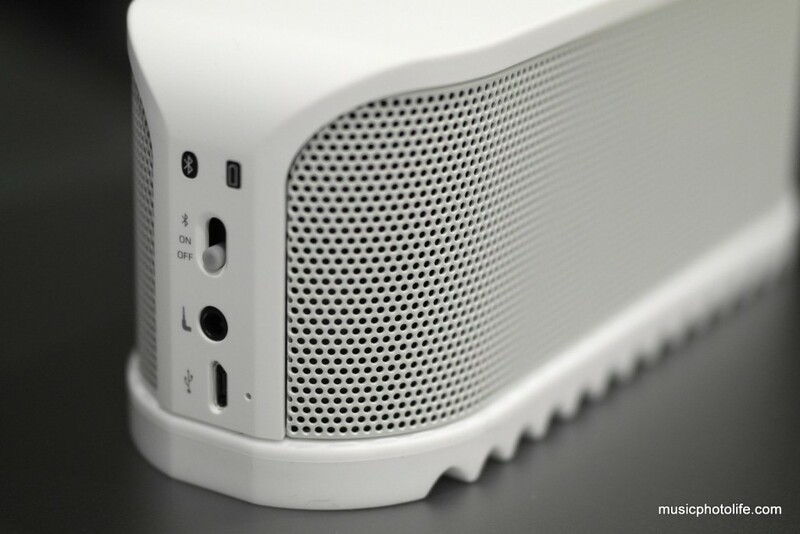 The Jabra SOLEMATE Bluetooth Portable Speaker, just announced at IFA 2012 on 30 August, is with me for a review! – Sweat, dust, splash and shock resistant. Great for outdoor use! – Connect to your music device by Bluetooth, audio cable or USB cable. Convenient! – Built-in battery, with AC adapter included for charging via micro USB port. Yay to non-proprietary ports! – Up to 8 hours wireless music with on-demand voice prompts for remaining battery life. – 2 tweeters, 1 woofer, and 1 passive bass radiator, up to 120dB to rock da house! The retail packaging is entirely made of plastic material with spring catches to lock everything in place. Its transparent top offers a view of the uniquely-designed speaker with its base intentionally elevated to give the consumer a good view of the product, further enticing the consumer to make the purchase. The base of the packaging in opaque black, contains all the necessary accessories. The SOLEMATE itself looks good. The speaker drivers are protected by typical metal mesh, the top plastic part coated with rubbery material, the bottom rubber mimicking the sole of a shoe. I was rather skeptical about the weather-proof claims, but Jabra has clarified that the SOLEMATE when used with the included durable soundbag will be protected against liquid spills and sand. The soundbag is made of porous material to allow the SOLEMATE to be heard without sounding muffled. When I turn on the SOLEMATE, a synthesized start-up audio sequence is played, which actually startled me a little. When I turn off the SOLEMATE, another shutdown sound is heard. Basically, the SOLEMATE is voice-prompt driven, just like many of the Jabra Bluetooth products. When I switch to Bluetooth discovery mode, a male voice prompt will inform. When a Bluetooth device is paired successfully, a voice prompt will say, “Solemate Connected.” When I press the answer button during normal operation, the voice prompt will announce the battery life. Unfortunately, despite reducing the speaker volume, the voice prompts and on/off audio sequences remains loud. Although you cannot reduce the voice prompt volume, they can be disabled completely. This is achieved by pressing the Volume-down (-) button while turning on the power. Similarly, pressing the volume-up (+) button while turning on the power will enable the voice prompts again. Despite all the nice packaging and the design, the speaker, when played with a flat-response playback source, does not deliver what I had expected. The tweeter does not produce the higher frequencies clear enough, the bass does not resonate enough. There are some low-frequency distortion at loud volumes but they do not sound obvious, because it’s not loud enough. The SOLEMATE sounds flat, it does not hit me. Fortunately, all is not lost. Once the audio runs through equalizer, the SOLEMATE comes alive! By boosting the bass and tweeter, the SOLEMATE shines. Bass becomes more apparent, treble sounds are clearer. So, when you find the initial audio experience on the SOLEMATE disappointing, just work it through an equalizer. An absolute saving grace, but nonetheless disappointing that I have to tweak the sound when playing through the SOLEMATE. It’s not a convenient thing to do when I often change from headphones to earphones to speakers. And it would be nice if the SOLEMATE comes with track controls so that I can change music tracks when I am away from the phone. Other than playing music, the SOLEMATE can also function as a speakerphone when connected to a mobile phone. Press the call button in between the volume buttons to answer calls or dial the previous number. Speak directly to the SOLEMATE built-in mic and enjoy the freedom. Besides Bluetooth connection, the SOLEMATE can be connected using standard 3.5mm jack. Jabra has included its own orange-coloured nylon-coated cable underneath the speaker for convenience. In addition, the SOLEMATE also supports USB audio by plugging the USB cable into the computer which auto-installs the audio driver. Effectively, you can charge the SOLEMATE and play music using one USB cable. Sweet! So is it still worthy of its tagline “Ultimate Portable Speaker”? I would say yes. It’s ultimate features do not weigh entirely on the sound quality, but rather, the experience of using it. – Wrist loop allows ease of holding it on the go. – Well built material with thick rubber “sole” for rugged use. – Weather resistant, with the included durable soundbag. – Audio loud enough to be enjoyed outdoors. This is Jabra’s definition of portability: a device that you can bring it anywhere with you, to be enjoyed with the masses, in any weather conditions. Most other speakers are meant to be placed on a clean surface to be enjoyed, but the Jabra SOLEMATE is the first speaker that I would love to place it on any surface, hold it in my hands and groove to the beat. Audio may need to be equalized from the source player to achieve optimal enjoyment, but the SOLEMATE encourages the kind of social engagement not possible with other portable speakers. Currently retailing at S$288 (as at Sep 2012), purchase the SOLEMATE by 8 Nov 2012 to win a pair of tickets to ZoukOut. 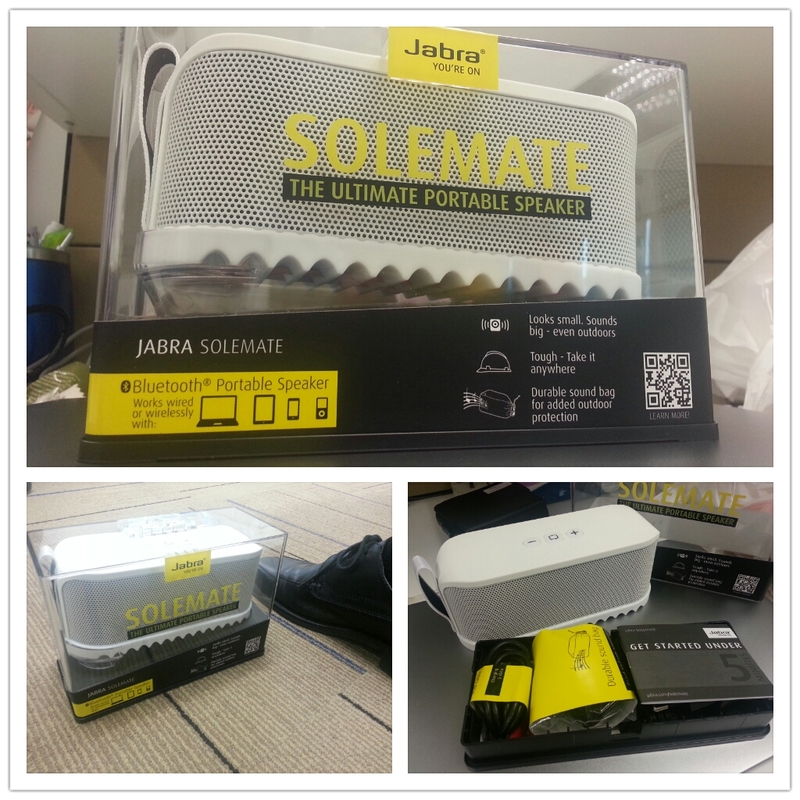 Visit http://setelco.com.sg/jabrasolemate for more information.